As I get back into the swing of things after a spell of being unwell I wanted a project which was quick and easy, and so I reached for the February Card Kit from Simon Says Stamp. The great thing about card kits is that so much of the work has been done for you. 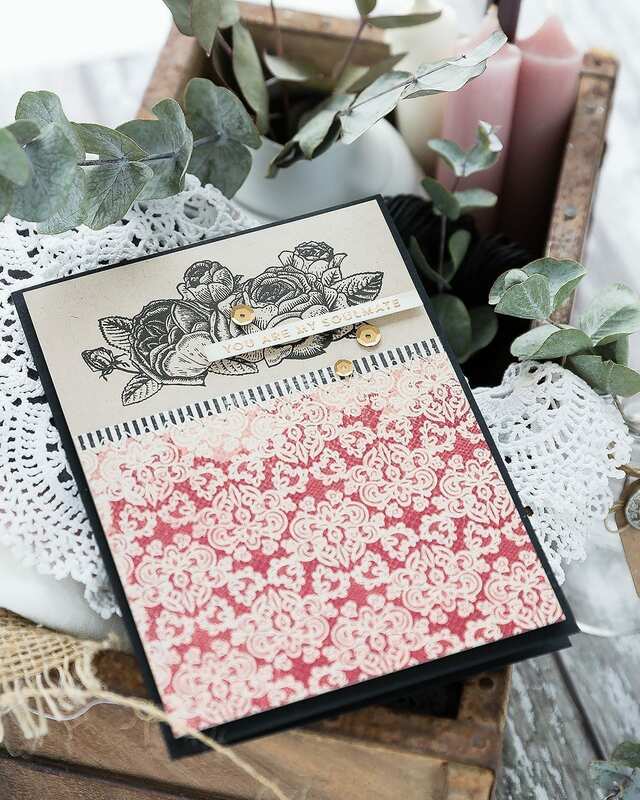 The stamps coordinate with the patterned papers as does the card stock which makes it so easy to put everything together. I’ve linked all supplies at the end of this post. Compensated affiliate links used where possible at no cost to you. 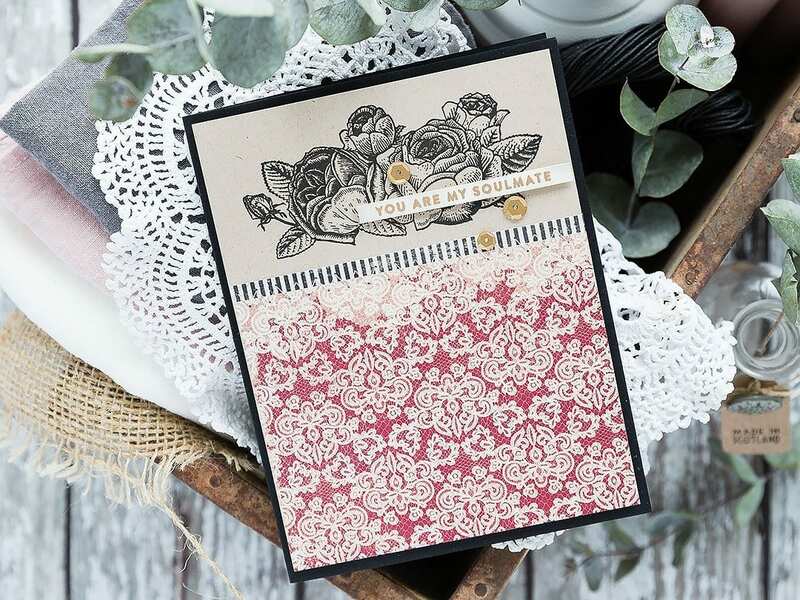 The Love Always stamp set from the kit has several gorgeous florals and a sweet bird too. The images are very detailed with shading and lots of detailed line work, and although I contemplated colouring the flowers in some way, I felt the amount of detail included would look lovely simply stamped in black on kraft and letting all the detail be the focal point. I dug around in the kit and found the Neenah Desert Storm card, a couple of Authentique patterned papers and a black pre-scored notecard and started to plan what I had in mind. I picked one of the floral sprigs to use and then trimmed the pieces of card and paper to size. 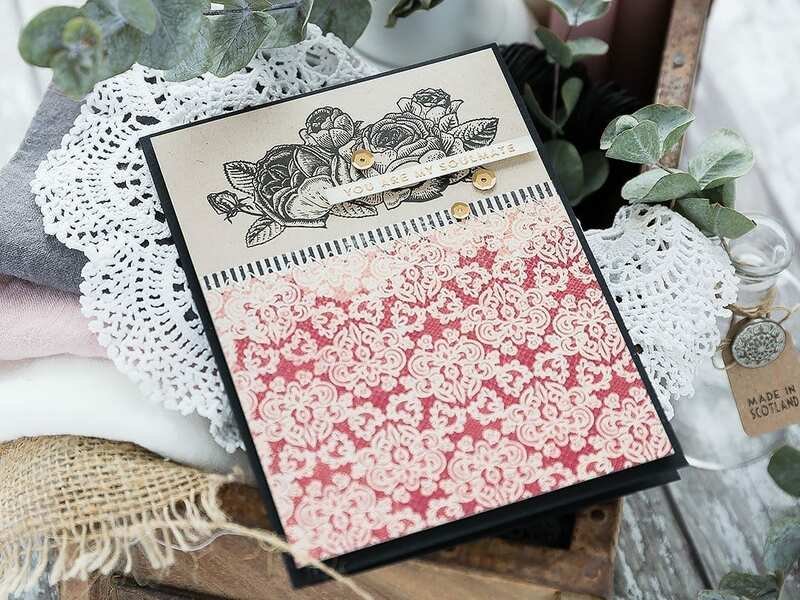 I planned to have the floral image stamped in the top third of the card on kraft card and then have the remaining front panel made up of the red patterned paper with a border along one edge of the black striped paper. I placed the Neenah Desert Storm piece I’d cut to be slightly smaller than the A2 black notecard in the Mini Misti and used the red piece of patterned paper as a guide as to where to centre the flower image. I closed the door of the Misti to pick up the stamp and then inked it in Versafine Onyx Black ink. This is a great ink for stamping fine details, and I always get a good impression the first time. I added a strip of Gina K glue runner along the back of the red patterned paper and then adhered the black stripe paper. I trimmed the piece to size and then added more glue runner on the back before adhering to the kraft piece. As this card has quite a vintage feel, I thought a little stitching would add a nice accent, and so I dug out my little sewing machine. This used to belong to my grandmother and is still going strong despite being made in the 1930s or something. I have the original manual tucked away, and it has the factory check date stamped in it. I love using it and the memories it brings back of my Nan. I ran a simple zig-zag stitch over the intersection between the two patterned papers and then pulled the loose threads onto the back of the kraft panel, kept them in place with pieces of washi and trimmed away the excess. I added foam adhesive to the back of the panel and then adhered to the front of the black pre-scored A2 notecard. For the sentiment, I pulled out the Love Always set again and chose the ‘You Are My Soulmate’ greeting. I cut a piece of Ivory card from that included in the Card Kit and placed it in the Mini Misti, treated it with an anti-static powder bag to prevent embossing powder randomly sticking everywhere and then stamped in clear embossing ink before sprinkling with Antique Gold embossing powder and heat setting. I trimmed the piece to a skinny banner with a clear ruler and scalpel and then to give it a more aged appearance to fit with the rest of the card, I used a Picket Fence Blender Brush and Stone Ink from Simon Says Stamp and lightly rubbed the strip until it took on a more vintage look. I added the greeting to the card with foam adhesive and used a T square ruler to ensure I had it on straight. As a final accent, I added a trio of gold sequins around the sentiment strip and kept them in place with Gina K Connect glue. This is really beautiful. Well done! This is a beautiful card Debby. I keep wondering if I should subscribe to the card kits. Last year there were two or three that I wasn’t sure about. Glad you are feeling better but I thought I heared still a bit of cold in your voice, hope you are completely well soon. So double thanks for this awesome card. Love the colours together. Great that you sill use the sewing machine of your grandmother, they made everything so strong in those days. Debby, I’m so sorry you’ve been so unwell… making this beautiful card must have made you feel better, right? So gorgeous… I’m so glad you didn’t color that gorgeous bouquet!! A lovely card Debby, it has never occurred to me to NOT colour the flowers but it looks great! 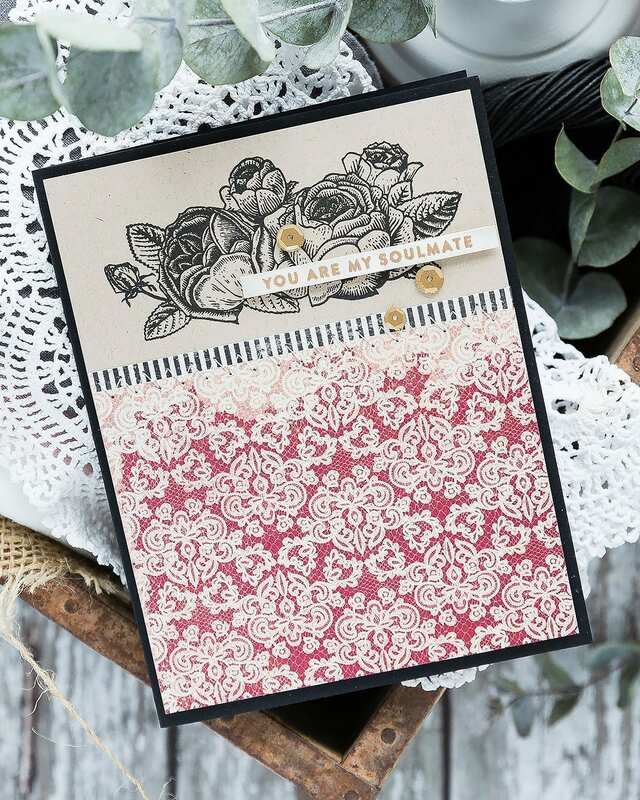 Beautiful card and great use of patterned paper. Just lovely Debby! I hope you feel better soon. My entire family here in San Francisco has had something or other since the beginning of the year. We are finally coming back to good health. Feeling grateful. Great card. Sorry you were ill . Glad you are starting to feel better. Keep getting better.